Picture: 4 Connecticutt Class Battleships, USS Kansas in lead, clear port on the first day of their cruise around the world. After the Spanish-American War the battleship building program began delivering in earnest. 1900 saw 3 ships commissioned: the first of the Illinois Class and two Kearsarge Class. This increased the total battleships in service from 5 to 8. In 1901, 2 ships completed the Illinois Class. Total battleships: 10. After that, there was a slow period. From 1902 to 1905 one ship was commissioned per year, including the USS Maryland in 1905. The Maryland was so weak that it was really a heavy cruiser. Total battleships 13. In 1906, Theodore Roosevelt's naval building program hit big. 6 ships were commissioned that year: 2 of the Connecticutt Class and 4 of the Virginia Class. Total battleships: 19. It is now 1907. 3 Connecticutts and 1 Virginia are commissioned. Total battleships: 24. 16 battleships comprised the Great White Fleet that Roosevelt dispatched on a voyage around the world. Then the British launched the HMS Dreadnought which rendered all of these ships obsolete. 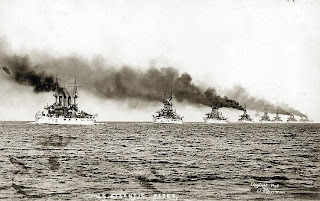 More information: US Battleship Classes, Great White Fleet, HMS Dreadnought.